Upon becoming a brigadier general, he commanded first the 1st Marine Expeditionary Brigade and then Task Force 58, during Operation Enduring Freedom in southern Afghanistan. As a major general, he commanded the 1st Marine Division during the initial attack and subsequent stability operations in Iraq during Operation Iraqi Freedom. In his first tour as a lieutenant general, he commanded the Marine Corps Combat Development Command and served as the deputy commandant for combat development. He also commanded the I Marine Expeditionary Force and served as the commander of U.S. Marine Forces Central Command. Previous to this assignment, he served as both NATO’s Supreme Allied Commander Transformation from 2007-2009 and as commander, U.S. Joint Forces Command from 2007-2010. 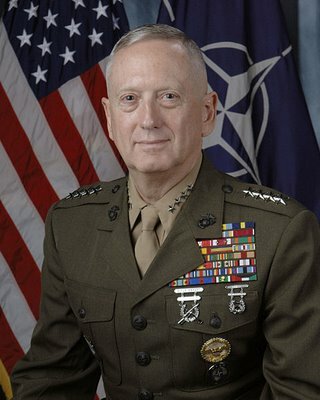 Gen. Mattis, a native of the Pacific Northwest, graduated from Central Washington State University in 1972. He is also a graduate of the Amphibious Warfare School, Marine Corps Command and Staff College, and the National War College.